I saw a woman wearing this necklace the other day and had to ask where she got it from. Miraculously it's from Urban Outfitters and is currently for sale online for less than $60. 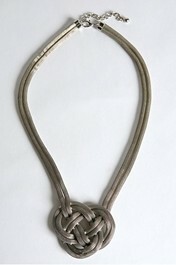 This Serpentine necklace comes in brass and silver. It's really a good investment because it looks like it's worth $300 and it's classic yet edgy, so it won't go out of style and can be worn with a T-shirt or an elegant dress.